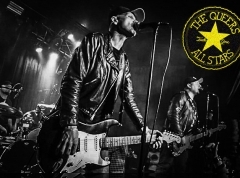 RF.net: How are things at Backyard Babies, what's new? Dregen: Well, things in Backyard Babies camp are really good. We're just about to do a sound check in Rome, in Italy. So we've finished all in all about a month on the new tour. We did two weeks in Sweden, like late festivals at the end of August, and then we've been two and a half weeks in England, we did a show in Holland, and then we have a couple of days off, and now we're starting tonight in Rome to do the rest of Europe. RF.net: That sounds really good. What are your expectations for the tour? Dregen: Well I mean expectations are always high but I mean we try.. it feels like we have an album that can actually fill up the clubs this time so we're really happy with the album and the live shows so far have been really good. I mean this is our sixth album so this time around we've got a lot of songs to choose from. So that's good! RF.net: You've just recently released your new album, which is actually self-titled. What are your thoughts on the album? Dregen: Well it may be kind of weird to have a self titled album as your sixth album but I think that the album, early when we were writing the album and starting rehearsing, we felt like it was the most Backyard Babies sounding album, so it's kind of the essence of Backyard Babies in a way, and I think that's why we've called it self-titled. Because if you're a new fan, then you wanna check out the band, and you check out the new album. And lets say that you don't like it, then I wouldn't even recommend or bother you to listen the old songs either. Or any of the old albums. So I think this very much is the ultimate up-to-date Backyard Babies album. And also you know, next year in September, we're still gonna be on tour on this album, so then we are celebrating our twenty year anniversary as the lineup as well. So I guess it's a little celebration to the band name. RF.net: Yeah sure. My next question was gonna be actually that, well, you've called it self-titled like many big bands call their definitive albums self-titles - like Metallica or Rage Against The Machine - so basically what you're saying is that you perceive your album the same way, as THE Backyard Babies album? Dregen: Well I wouldn't say.. well up to date, I would say this is the ultimate Backyard Babies album, but I think that it feels that we've managed to do a better album than the last.. I mean, this is what we've learned up to date. So I wouldn't say that this is... I have really high expectations for our next album, too. I think that at the end of the line when you look back at it in lets say 60 years, I wouldn't see that this is the best Backyard Babies album. I still think that we can manage to write better ones. RF.net: On the album, you have artwork which has a striking resemblance to the famous Charles Ebbetts photograph with 11 workers eating lunch on a skyscraper. I'm not sure if you've seen it? Dregen: Yeah that was actually.. yeah, you've got the point! RF.net: Alright, so how come you chose to imitate this famous photograph? Any particular reason? Dregen: Well, ever since I was a kid, that photograph has been with me, and I guess with a lot of people, you know, and the guy Michael, the guy who we always work with as a photographer, he's been doing our artwork for many years. We were having a lunch meeting, talking about what we should do for the next album. And that picture was actually on the wall of a dodgy pizzeria in Stockholm, so we had the idea of like.. I've never seen anyone done a cover art of that photo before. It also reminds me of the first picture when I got into music in the first place. It was a picture of Kiss from 1976, that was the first picture of Kiss I ever saw, I was maybe like five or six years old, and I remember it so well. They did a photo shoot up in the Empire State Building and it reminds me a little bit of that too. And I think that that picture of the construction workers having lunch break is when they're actually building the RCA Building in New York, and we just left the record company as well, so [laughs] it's got a little bit of a story behind it. RF.net: Actually I was gonna ask as well, like you said you were on RCA before, which was a major label, and now you're on a much smaller label. How come you left RCA, first of all? Dregen: Well we've always had a little dream of having our own record label, and finally I think that we are capable of having that now and we have solid fanbase. I think that instead of whining on your record company all the time that they're not doing their jobs and stuff, we thought that it's about time that we take care of it ourselves, you know. And also I think with the music industry and how it is, I think it can be really good to own your own master, in a way. And I don't know, I think that maybe, if we can pick up a new band, or new musicians, or whatever, maybe we can sign them to Billion Dollar Babies and also.. I don't know, maybe help them with song writing and maybe produce them, and use Billion Dollar Babies as their first step in the career. That's maybe when I'm getting a bit older though. RF.net: Have you got any band already in mind, perhaps, that you'd like to sign? Dregen: I just did an interview before this and you're talking to a guy who has been in the basement and rehearsal room for the last seven or eight months, so I didn't even know that there was a thing called Olympics in Beigin, I just found out a couple of days ago. I don't really know what's going on around. So I haven't heard that many new, good bands, no. RF.net: If we go a little bit back in time... your song "Minus Celsius" is probably your most widely known song and obviously "Stockholm Syndrome", whcih won a grammy, is probably your most known album. So do you think you'll be able to achive similar success with the new album? Dregen: Definitely! Lets see, I think that the Grammy awards are in February.. I think so, I mean, "Minus Celsius" was a.. I think that all in all we have a more solid, strong album than the "Stockholm Syndrome" album. I mean I love all our albums actually, but I think that we have more singles to pick from on this album. So I think that this album at the end of is capable of taking us way further than the "Stockholm Syndrome" album did. RF.net: So would you say you were a bigger band a few years ago than you are today? Dregen: No, I wouldn't. I would say that... well if you ask any band, even Bruce Springsteen, U2.. or even Metallica, they've released an album.. I wouldn't say that Metallica is a smaller band today because they sell less albums than the black album. But I guess in a way it's harder to actually say how big bands are today because you can't really compare to record sales anymore, but we've never sold more tickets than now, so I guess that the live situation is really good for us. So I guess that's a good sign. RF.net: If we take a look back at your career again, you've changed quite a lot since your debut album. How do you feel you've changed since then as a band? Dregen: Well, I guess that the band has kind of the same idea ever since we started, but we started this band when we were 15 years old, and we're still the same lineup. So I don't know what's changed. Nobody was travelling with shavers on tour in the beginning, you know [laughs], we were kind of like young boys turning into hairy old men nowadays. But I guess that the idea of it is to play good rock and roll music, which I think we've achieved. But I guess that musically, we've of course grown as a band, but lyrically, maybe we kind of sing about the same kind of things, it's stories about our lives.. we're not really the band that sings about ghosts and goblins in the woods 2000 years B.C, but I guess when we were 15 we were writing songs about what we thought that things should be about, and nowadays we are actually writing about how things are. RF.net: Like you mentioned before, you guys have had the same lineup for ever since your debut album. So I just wanted to ask: What's the secret, cause a lot of bands tend to change members? RF.net: Do you think it's more difficult being in a band that originates from Sweden than, say, the UK or the US? Dregen: No, I would say the opposite, actually. I think that basically if you're signed to a major label, I would say that the UK and American fans are way more...how should I call it...I don't know the English word for it, but they're more... it's less rebellious, I think. It's a lot of the A&R stuff at the record label, they more or less tell the bands that we want an album that sounds like this, and we want you to look like this, and we want you to do like this. And the bands are just answering yes, I don't think that's the... that's maybe why we're still playing together after 20 years because I mean, of course we've done some compromising but not too much, I mean we still do what we wanna do, and I think we have musical freedom in what we're doing, so.. but I think that speaks for not just Sweden, I think it speaks for... bands in Europe in general are not so forced to stuff. I think that the American whole record industry are more in control over their artists than in Europe. RF.net: You've released six albums overall, that's already more than most bands manage during their career. Which one has been your favorite so far? Dregen: Well I mean that's the most cliché answer I can give, I mean of course it's the latest album, but I guess every musician is telling that. But I'm honest, our last album is the one I'm most proud of, but also of course I'm really proud of an album called "Total 13" because that was kind of like the album that made us capable of touring basically all around the world. RF.net: How many more albums do you see Backyard Babies writing in the future? Dregen: Well I wanna say endless many albums, but we will continue to write albums as long as we think it's fun. So it's a hard question, but I have a really good feeling that I wouldn't wake up tomorrow and not think it should be fun to record another Backyard Babies album. So I don't think we're a band that has been painting ourselves into a corner, in a way. I think that we can still try out different types of music. In our iPod in our bus, for exampe, there's a really wide choosing range.. everything from Paul Teddy and Bob Dylan to Discharge and Slayer, so we shoot from every direction possible. RF.net: How does the future otherwise look like for Backyard Babies from today on? Dregen: We're gonna be on wheels up until around this time next year. After this European tour we're going to Australia and Japan, and then we're going to do an Eastern Europe kind of tour with Poland, Czech Republic and Hungary.. and then we'll do a couple of gigs in Russia, and then it's Christmas time. Then we're gonna do another Scandinavian Tour, and then next spring and summer it's gonna be all the festivals, because we were in the studio this summer. And hopefully, one thing missing in the Backyard Babies catalogue is a really good live DVD, so I think that's maybe a thing we're gonna check out. RF.net: Have you got a show planned in Denmark, cause I noticed you're not coming around this time? Dregen: We have actually been talking about it.. I think that we have a show planned in Denmark, at least one in Copenhagen, but I guess that should be around January/February. RF.net: Okay, nice to hear. That's it from me, thanks for doing this interview and taking the time. Dregen: Thank you very much, I hope to see you in Copenhagen!